890 mm wide bathroom furniture to co-ordinate with the 3D Washbasin range designed by the internationally recognized code.2.design studio. Left hand cut out: 890 x 220 x 477 mm. Right hand cut out: 890 x 220 x 485 mm. Left hand cut out, pull-out drawer with soft closing mechanism, alpine white. Left hand cut out, pull-out drawer with soft closing mechanism, plum. Right hand cut out, pull-out drawer with soft closing mechanism, alpine white. 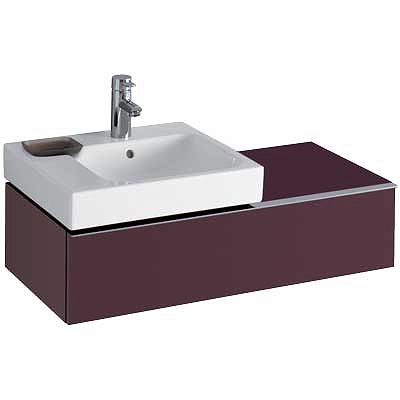 Right hand cut out, pull-out drawer with soft closing mechanism, plum.